JBC tools are currently the smallest, lightest & most ergonomic. The short distance tip-to-grip provides greater precision & improved control of the tool. The variety of grips allows you to select the model that best fits your hand. 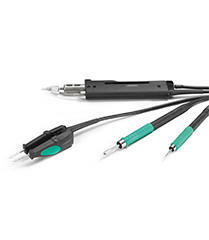 JBC fume extraction kits offer an easy & safe method to remove fumes generated at a solder joint, which seamlessly adapt to JBC handpieces & solder feed irons. NB a suction pump & filter are required.